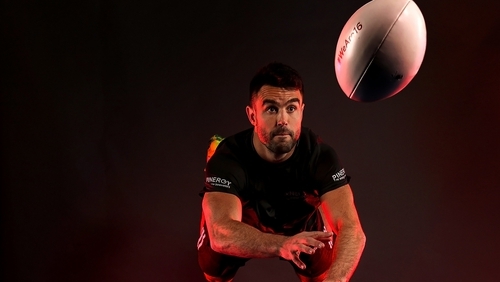 Conor Murray has no regrets about how he handled news about a neck injury that has kept him out of the game since July. The Munster and Ireland scrum-half instructed coach Johann van Graan not to reveal the specifics of what turned out to be a neck injury as he himself waited for a full diagnosis. The unusual step led to a lot of speculation about the seriousness of the problem but Murray says that he would not change how he dealt with the issue, which he now says will be cleared up in "matter of weeks". "We’re nearly there, it’s been a frustrating injury," he told RTÉ Sport at the launch of Pinergy’s #WeAre16 campaign. "We can’t put a timeline on a return but we’re looking at weeks now. I’m doing 90% of the training with Munster for the last three weeks or so, doing modified contact on the sideline. "I’m happy with the way we handled it. We approached it with the viewpoint of keeping it to ourselves. "The reason we kept it quiet at the start is because we didn’t know what it was. We couldn’t put a date on it. "That was my whole thinking behind it, it wasn’t ever the whole data protection or me keeping it secret. "I think a week or two [after Van Graan spoke to the media], we said it was a neck injury, that we were managing my neck injury and then by the time we said that, the rumour mill had started, everything had snowballed and it was just this big deal. "If an injury like that happened again, I’d do the exact same thing." Murray also revealed that the injury was not something that occurred due to one incident but happened after a series of knocks, and was not too different from an injury that he suffered against Wales in the 2017 Six Nations. "I got a couple of bangs in [the summer Tests against] Australia and a bit of wear and tear basically. I got a bang in each game," said the 29-year-old, who was left out of Joe Schmidt's 42-man squad for the November games as he continues his rehabilitation. "In the third game, I probably got my biggest bang and it just flared up over the summer when I was away. "I had to let it settle, obviously, the usual scans and things like that, and I had an MRI about four weeks ago. The disc is gone back in, it was just a bulging disk like I’ve had – nothing major. "It’s gone back to where it was, thankfully, and that’s a pretty big step for us, a result that meant we could crack on and wait for the strength to come back. It’s doing that, it’s been a progression all the time, so nearly there. "Similar injury [to against Wales]. It was a reoccurring thing. "You just got to give it time because it happened against Wales and by the time the Lions tour came around it was still affecting me a small bit. "Thankfully I have a window now to get it strong, get it right, get back playing and put it to bed." The example of Jamie Heaslip had perhaps added to the concern with the former Ireland and Leinster forward also choosing not to reveal details of his back injury, which subsequently forced him to retire. However, earlier this month Murray signed a contract extension with Munster and the IRFU that will keep him in the country until 2022. He added that, despite the departure of former team-mates Donnacha Ryan and good friend Simon Zebo to France, the call was straightforward. "It was a really easy, really quick decision," he said. "I love playing with Munster and I love what we have down there. We are definitely building. Last season we were good and we’ve made some improvements. "With Ireland it was a no-brainer, in the last four or five years we’ve had some really good success. "This team is going places and there’s an awful lot left in this team and I want to be around for that."